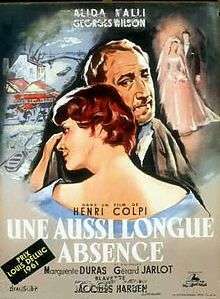 The Long Absence (French: Une aussi longue absence) is a 1961 French film directed by Henri Colpi. It tells the story of Therese (Alida Valli), a café owner mourning the mysterious disappearance of her husband sixteen years earlier. A tramp arrives in the town and she believes him to be her husband. But he is suffering from amnesia and she tries to bring back his memory of earlier times. The Long Absence shared the Palme d'Or prize with the Luis Buñuel film Viridiana at the 1961 Cannes Film Festival. ↑ "Festival de Cannes: The Long Absence". festival-cannes.com. Retrieved 2009-02-20.